Harvey's historic floods left behind epic damage — and some urgent questions that will take months, if not years, to answer. Clarification: This story was updated to more accurately explain the Army Corps of Engineers' assessment of the integrity of the Addicks and Barker reservoirs. Houston and the Gulf Coast are learning hard lessons about their vulnerability to flooding after Hurricane Harvey — which was the latest and by far the biggest in a three-year stretch of major inundations for Houston that included the Memorial Day and Tax Day floods. People who didn’t think they needed flood insurance – because they weren’t in a designated flood zone – have learned that the flood maps are increasingly irrelevant. Local leaders and flood control planners are learning that 500-year floods may become regular occurrences. How will Texas spend billions in federal long-term recovery money? So far, the state is leaning hard on the federal government to fix what Harvey broke. Despite enduring the rainiest day in recorded history — up to 50 inches fell in parts of Houston at Harvey’s peak — Texas’ top leaders have resisted tapping the so-called Rainy Day Fund (which currently stands at about $10 billion) to help with the recovery. The U.S. Department of Housing and Urban Development has announced Texas will receive just over $5 billion for long-term rebuilding efforts. Texas leaders would like more. They have estimated the state needs as much as $121 billion — and they want as few limitations on how to spend that money as possible. They argue that officials in cities and counties battered by the storm know best whether money should go to individual households or public works projects. But the state’s requests for flexibility — along with an infrastructure-heavy wish list — have sparked alarm among housing advocates who fear homeowners and impoverished communities will get shortchanged in favor of large-scale infrastructure projects that could have little connection to disaster recovery. A bigger question: How long will it take the money to get where it’s supposed to go? After Hurricanes Ike and Dolly struck the Texas coast, the state received $3 billion in 2008 from the U.S. Department of Housing and Urban Development for long-term rebuilding. When will Houston's justice system get back to normal? After Harvey hit in late August, trials in one of the country’s busiest criminal justice systems were delayed for months. Damage from the storm left the city’s Criminal Justice Center — a 20-story building that houses 40 courtrooms, the district attorney’s office and enough holding cells to accommodate 900 inmates — out of commission for months, and swamped its jury assembly building perhaps beyond repair. Jury trials resumed October 16, but the backlog in pending cases persists. Judges continue to double up on courtrooms, with trial courts allocated on a rotating basis. The system is churning — but haltingly. And that will be the status “for the foreseeable future,” said Judge Bob Schaffer, administrative judge for the Harris County district courts. Court officials said proceedings are not likely to return to normal until the facilities are restored to full occupancy, which could take as long as another year and will cost tens of millions of dollars. But the justice system is slowly coming back to life: Cases are being heard, albeit slowly, and verdicts are being handed down. Well over 5,000 people already have reported for jury duty. How will the Gulf Coast address the flood risks that Harvey exposed? The state has a list of big-ticket infrastructure projects for flood mitigation and prevention. And officials are hoping the feds will pay for all or most of it. Reservoir improvements: The Addicks and Barker reservoirs west of downtown Houston — which are essentially earthen berms designed to temporarily hold back floodwaters before releasing them into Buffalo Bayou — are considered "high risk" by the U.S. Army Corps of Engineers, which maintains and operates them (the Army Corps says the dams are structurally sound, and that designation reflects the dams' proximity to a major population center). To make matters worse, developers have plopped about 14,000 homes inside their flood basins (many of those homes flooded during Harvey) and all that new development is sending more runoff into the reservoirs during storms. The reservoirs need major upgrades, and there’s serious talk of building another one to take the pressure off Addicks and Barker. That’ll take a lot of land and a lot of money — and years of work to complete. 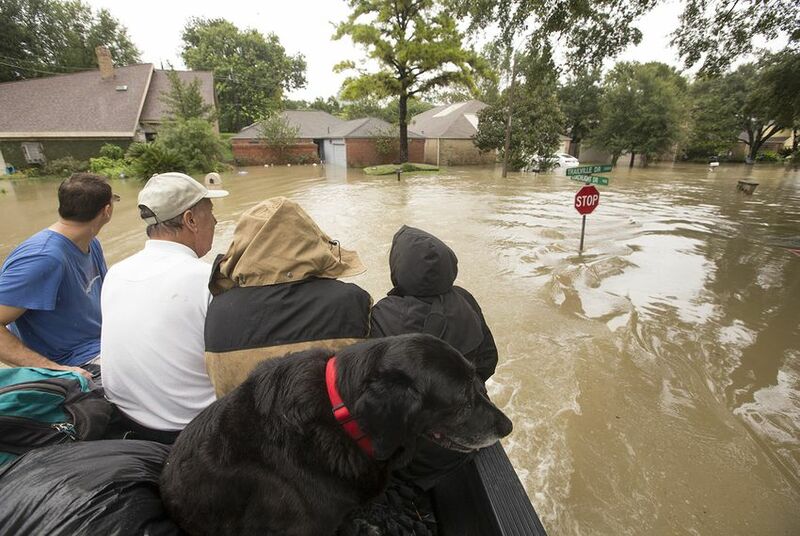 Buyouts: After three flood events in three years, lots of Houstonians are talking about buyouts. But as we discovered through our investigation with ProPublica in November, buyouts aren’t likely to be a large-scale solution to the city’s flooding problems, mainly because of a lack of money and narrow criteria that disqualify many homeowners who are willing to sell. The Ike Dike: A coastal barrier built just off the coast to blunt a hurricane storm surge remains the holy grail for protecting Houston, Galveston and the area’s vast and vulnerable refineries and petrochemical plants. But the price tag could run as high as $11 billion to protect a six-county stretch of coastline — and it wouldn’t help in a major rain event like Harvey. How long will it take for displaced people to return home? This is probably the most pressing question for the people whose lives have been uprooted by Harvey — and the most difficult to answer because it plays out one home at a time. About a month after Harvey struck, more than 24,000 families were living in FEMA-funded hotel rooms; that number dropped to about 11,300 families by mid-December as homes were repaired, renters found new apartments and others found better long-term housing options. But the FEMA hotel statistics don’t capture the full extent of the need, because they don't include countless people still living with family or friends, in tents, in recreational vehicles or in rented apartments or rooms. More than 90,000 people have filed insurance claims through the National Flood Insurance Program, also managed by FEMA. That’s equivalent to the entire population of Sugar Land. How long it takes for that many people to get back to normal involves a complicated calculus — the amount of damage, whether they rented or owned their home, whether they had flood insurance, and how long it takes for insurance adjustors, demolition crews and contractors to do their work. But for many Harvey victims, recovery will be measured in years.